Nevertheless, a lot of people including a significant number of doctors, healthcare professionals, and researchers seem to be confusing these two conditions. I am not pointing out these groups just to pick on them; I feel like I have to point this out because patients and their families are relying on these people to provide appropriate care and advice. If they confuse these conditions, real harm can result. So, lets start with what these two conditions have in common and how that is leading to confusion. Both syndromes involve the MECP2 gene, which is normally located on the X chromosome. Because the same gene is involved, research on better understanding the role and function of the MECP2 gene has the potential to benefit individuals with either disorder. How do they differ? 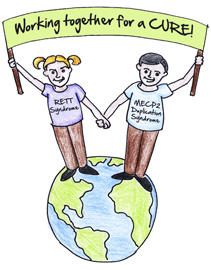 In Rett syndrome, the MECP2 gene is damaged or otherwise UNDERACTIVE, so it produces too little MeCP2 protein. 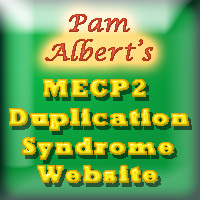 In MECP2 Duplication Syndrome, the gene is usually normal, but there is an extra copy of the gene in each cell, resulting in OVERACTIVITY and production of too much MeCP2 protein. It is like the difference between a drought and a flood. These are both problems involving water, but they are far from the same thing. 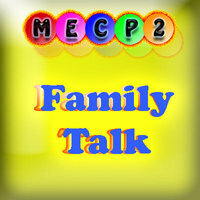 The problem that I have seen most frequently seems to be that sometimes people see “MECP2” and immediately assume this means Rett syndrome. Sometimes it is a bit more complicated than that. For example, because Rett syndrome affects mostly girls and MECP2 Duplication Syndrome affects mostly boys, sometimes people assume that boys can never can have Rett syndrome and girls can never have MECP2 duplication syndrome, but that is not true. Why does this mislabeling matter? Getting this right is important for several reasons. For example, I recently heard from someone whose doctor told her she was not a carrier of MECP2 Duplication Syndrome based on a laboratory test. Unfortunately, the test that was performed was actually a test for Rett syndrome, so the result was actually meaningless. She should have had an entirely different test. As we get closer to having treatments available for both syndromes, the correct diagnosis becomes even more critical. Treatments for Rett syndrome will likely try to increase the levels of MeCP2 protein, and that almost certainly would make things worse for someone with MECP2 duplication syndrome. Treatments for MECP2 Duplication Syndrome would lower levels of MeCP2 and that would almost certainly make things worse for someone with Rett syndrome. This entry was posted in Genetics, health care, Opinion and tagged Genetics, health. Bookmark the permalink.